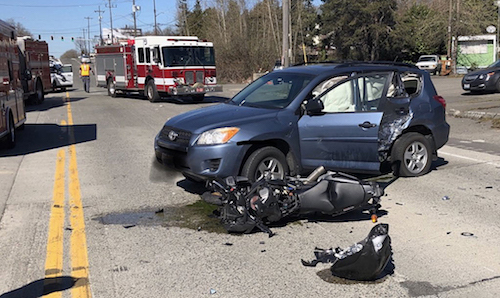 At least one person was badly injured in a collision between a motorcycle and SUV on Monday in Skyway, according to police. The incident occurred around 12:50 p.m. in the 13000 block of Martin Luther King Jr. Way South. Police say one person was taken from the scene in an ambulance. The victim’s condition was not immediately available. A preliminary investigation determined that the motorcyclist was heading east on Martin Luther King Jr. Way South as the SUV pulled onto the roadway from a parking lot. The motorcyclist tried to avoid the SUV but could not, crashing into the side of the SUV. All lanes of the highway are currently closed at the scene. 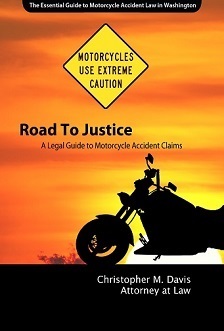 Motorcyclists are afforded less protection and are exposed to far greater dangers than drivers in cars. And at the same time, those same drivers in cars often do not give motorcycle riders the respect they deserve. Motorcycles wiping out and the rider comes into contact with the pavement or other vehicles. Motorcycles are not as stable as other vehicles, making them prone to accidents. Even a slight impact on a lightweight motorcycle can cause serious injuries. Drivers of other vehicles may not see motorcycles because of their lack of size. If you or someone you know has suffered an injury in a motorcycle accident in Washington state caused by someone else, you and your family should not have to deal with the consequences on your own. Contact a reputable motorcycle accident lawyer today for help. At Davis Law Group, our attorneys have secured millions in compensation for motorcycle accident victims over the past 25 years. Our experience, knowledge, resources and work ethic sets us apart. Contact us today for a free, no obligation case evaluation with an attorney. Call (206) 727-4000, use the chat feature below or fill out the contact form on this page to get started.